If you’ve never had coffee before, its effects are profound. Increased alertness, an improvement in an overall feeling of wellbeing, a sharpened focus on wanting to get things done. You feel, in short, like a Coffee Achiever. If you’ve never had debt before, you can suddenly afford things you couldn’t afford, with no expenditure of time of effort. Instant gratification. But after a while, one cup does little, and it takes two to get these effects. Then, before long, you’re exhausted without it, drink cup after cup just to wake up at all, and then start getting nauseous and jittery. Congratulations. You’re addicted to caffeine, and the only way out is to cut back and suffer through headaches and irritability in the meantime. There are no physiological free lunches. And there are no economic free lunches, either. More of a stimulant, over time, produces less and less of the desired effect, and more and more of those you don't. People compare debt to addictive drugs, and as with some of those drugs, the dose needed to achieve the desired effect tends to rise over time. 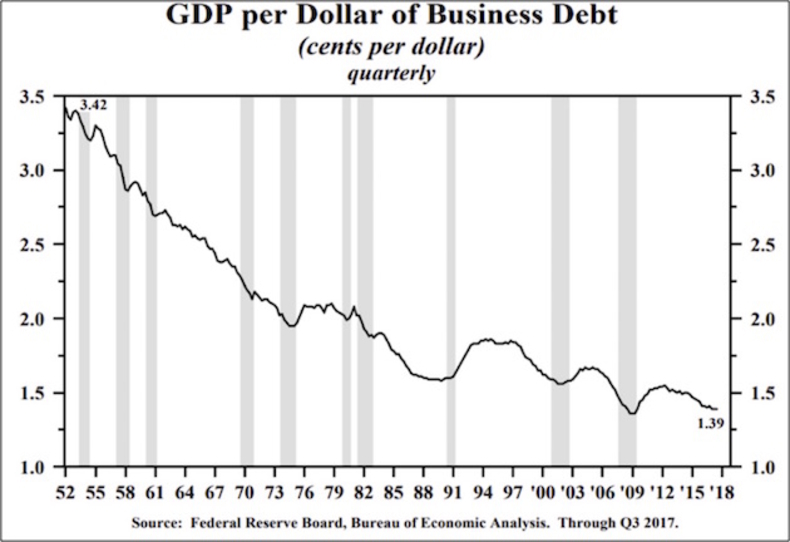 The next chart shows the additional economic output (GDP) generated by each additional dollar of business debt in the US. As you can see, debt has become steadily less stimulative over the last several decades. But focus specifically on the lower right area. We saw the debt-growth effect rise, but only for a couple of years as the economy came out of recession. It began sliding again right about the time Ben Bernanke said the Fed would begin “tapering” its QE bond purchases. Now it’s almost back down where it was in the trough of the recession. That’s not encouraging. The US is not the only country experiencing the dynamic of less growth per dollar borrowed. China in particular has been watching its return on debt drop far more than the US’s has. The Chinese are on a path to almost double their total debt in less than 10 years from 2008, to a level that is far above total US debt and the total debt of much of the rest of the world. There is a reason that Moody’s downgraded China’s debt last year.